Gordon Hayward of Utah Jazz and Tina Thompson WNBA Legend To Visit Manila, Philippines For Jr. NBA Presented By Alaska: When and Where? Gordon Hayward of the Utah Jazz and WNBA Legend Tina Thompson will be visiting Manila to participate in the Jr. NBA/Jr. WNBA Philippines 2014 presented by Alaska National Training Camp to help coach participants from all over the country vying to become Jr. NBA/Jr. WNBA All-Stars. The National Training Camp will be held at the Philippine International Convention Center (PICC) Forum 2 & 3 from April 25-26 and the SM MOA Concert Hall on April 27. 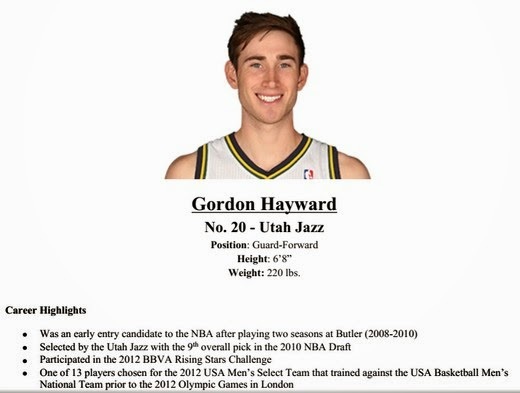 Gordon Hayward—a 6’8” forward out of Butler—was selected 9th overall by the Utah Jazz in the 2010 NBA Draft. 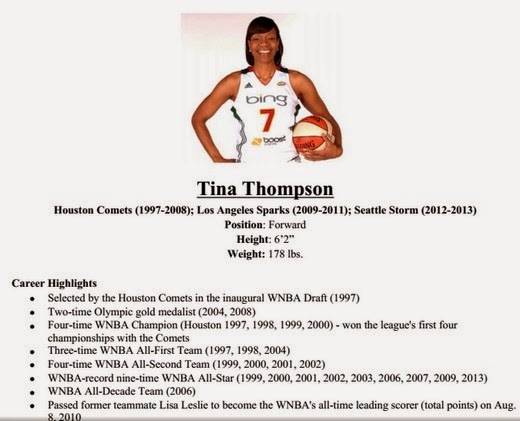 Tina Thompson was a 4 -time WNBA champion and nine-time WNBA All-Star—was the first-ever draft pick in WNBA history and one of the greatest WNBA players of all-time, having been voted by fans as one of the top 15 players in WNBA history. Thompson spent 17 seasons in the WNBA, playing for the Houston Comets, the Los Angeles Sparks and the Seattle Storm before retiring in 2013. Take note of this guys and gals, Thompson and Hayward and will join Jr. NBA/Jr. WNBA Head Coach Sefu Bernard and PBA Legend Jojo Lastimosa of the Alaska Aces to help run the National Training Camp and conduct NBA Cares activities in Metro Manila. They will also coach in the second annual Jr. NBA Alumni All-Star game featuring past Jr. NBA standouts. Hayward and Thompson follow BJ Armstrong, AC Green, Luc Longley and Muggsy Bogues as NBA Players/Legends who have been part of Jr. NBA program in the Philippines. The National Training Camp is the culmination of the Jr. NBA/Jr. WNBA Philippines 2014 presented by Alaska program, providing the top 50 boys and top 24 girls the opportunity to train with and compete against their peers. The top participants were selected from regional selection camp participants from Surigao, Iloilo, Cebu, Dagupan, Puerto Princesa and the NCR, as well as the Alaska Power Camps. At the end of the National Training Camp, 10 boys will be named as Jr. NBA All-Stars and 5 girls will be named as inaugural Jr. WNBA All-Stars. These select campers will be rewarded with a unique NBA experience and the opportunity to play against a counterpart team from another country later in the year. The search for the 2014 Jr. NBA and Jr. WNBA Coach of the Year will also conclude at the National Training Camp. The Coach of the Year award winners—which will be announced on the final day of the National Training Camp—will take part in the NBA experience alongside the Jr. NBA and Jr. WNBA All-Stars. Jr. NBA/Jr. WNBA is the NBA’s international youth development program that promotes basketball participation and an active lifestyle among children. Participants are trained in the fundamentals of basketball and learn the importance of the Jr. NBA/Jr. WNBA core values of Sportsmanship, Teamwork, a positive Attitude, and Respect (S.T.A.R.). The 2014 Philippine schedule included school clinics as well as coaching seminars in the lead up to Regional Selection Camps. The program, which remains free and open to players between 10 and 14 years old, concludes in Metro Manila with the Jr. NBA/Jr. WNBA National Training Camp. Jr. NBA/Jr. WNBA is presented by Alaska. Gatorade and Phoenix Petroleum are Official Partners, while KFC and Spalding are Supporting Partners. The SM Mall of Asia and SM Cinemas are the Official Venues for Jr. NBA/Jr. WNBA. Official NBA Broadcasters are Basketball TV, NBA Premium TV and ABS-CBN Sports. Jr. NBA/Jr. WNBA is also supported by the Basketball Coaches Association of the Philippines (BCAP). The Jr. NBA program was first conducted in the Philippines in 2007 and has more than doubled in participation in the past six years. Each year a new city benefits from the grassroots basketball program that involves not just young players but also their parents and coaches. This year, more than 80,000 students, parents, and coaches will benefit through Jr. NBA/Jr. WNBA activities including camps and clinics, NBA Cares outreach activities, television programs and digital initiatives. Visit the Jr. NBA/Jr. WNBA event website at www.jrnba.asia/philippines. Fans can also follow Jr. NBA/Jr. WNBA on Facebook at www.facebook.com/jrnbaphilippines. For all things NBA, visit www.nba.com and follow us on Facebook (www.facebook.com/philsnba) and Twitter (www.twitter.com/nba_philippines).